Humane Fox Deterrence might be termed “The Thinking Man’s Pest Control”. Rather than simply blast something away with a gun, as old fashioned ‘pest controllers’ continue to do, thereby creating, at best, a very temporary solution to a problem, fox deterrence utilises a knowledge of fox psychology and turns that psychology on the animal itself. This means you get your garden problems sorted and the animal doesn’t lose it’s life. It also gets an education in what not to do on your property. And because it remains in the general area, it defends its (and your) territory against new foxes who would otherwise quickly fill the vacant territory and who might commit the same ‘nuisance’ as it did, itself, before it understood the rules! Most fox ‘nuisance’ experienced by people in urban and suburban areas falls into three categories; digging, fouling and noise. 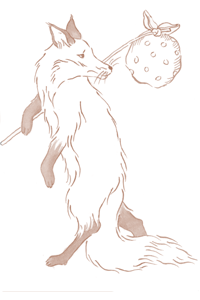 These are all aspects of natural fox behaviour. Depending on time of year and location, digging may be to establish a breeding earth, a bolt-hole, a route from a to b or simply to locate insect and invertebrate prey. Fouling, whilst a natural function in itself, is also a means of marking territory. For the same reason a pet dog urinates against every tree it passes, a fox creates ‘signposts’ for the information of other animals, often using dominant features such as drainpipes, wall corners or even garden gnomes! Because this is part of normal fox territorial behaviour, it is easy to get in on the act by using an artificial ‘scentmark’. This is where a good fox repellent comes in. A scentmarking contest between two animals usually results in acceptance by each of their dominant or subordinate position in the pecking order. However, where the ‘scentmark’ cannot be identified and contested, an animal may become nervous and choose to avoid the area, particularly if it has infant cubs. In effect, repellents use the animal’s own ammunition against it. Having extensively tested every repellent on the market, we regard the most effective products as “Scoot” and “Get Off My Garden”. These are safe, proprietary mammal repellents and are available from garden centres and hardware stores. “Get Off My Garden” is a general purpose repellent, which may be used at ground level or underground and which can be applied directly onto growing plants. “Scoot” is effective as a foliage or lawn spray where fouling or digging is taking place. Not all methods of deterrence involve chemicals. During experiments carried out in association with Greenwich University, we found ultrasonic devices broadly ineffective, but we found a water driven gadget, called “Scarecrow”, very effective. The level of advice that can be provided without on site viewing carries no guarantee of success, because all situations are unique and a consultant can no more guarantee to solve your problem by ‘phone or email than a plumber can fix your pipes by telepathy. What you have here is concise DIY advice. A more comprehensive book called “Unearthing the Urban Fox” is available on our sales goods page, or through our admin office, priced £7.95. 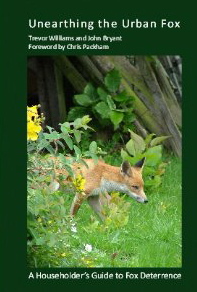 For those who prefer personal, professional on-site service or more specific advice, we recommend three highly experienced wildlife consultancies – Fox-a-Gon, Humane Urban Wildlife Deterrence and Foxolutions – all of which have links to their own websites and contact details in the box to the right of this page. But why deterrence? Can’t the council simply take the foxes away? Foxes are not and never have been classified as ‘vermin’, so local authorities have no legal obligation to act against them. They are also well aware there is little point. Private “pest controllers’ who offer such a service omit to inform you there is no such thing as a vacant territory. Remove one fox and another will take over the territory within weeks and all you’ve achieved is a less heavy wallet! Removal or destruction of foxes is, at best, an expensive confidence trick and at worst, an act of cruelty. Fox populations are self regulating. They cannot over-populate, but will always breed back to replace numbers lost since the previous breeding season. In fact, far from any increase in fox numbers, recent scientific surveys indicate the national fox population has fallen by 41% since 1995. If you want to get your own way with foxes, forget about old fashioned ‘pest control’. Deterrence is cheaper, more effective and more humane. To discuss on-site, call-out consultancy services call Fox-a-Gon on 0208 925 9639 or www.fox-a-gon.co.uk who, in addition to household garden work, are specialists in fox proofing large areas such as schools. Humane Urban Wildlife Deterrence (www.jbryant.co.uk) carry out small garden service call-outs but are prepared to offer limited verbal advice on 01732 357355 and enquiries@jbryant.co.uk. And for those who prefer a DIY option, Foxolutions stock and provide the most effective deterrents and may be reached on 0208 090 2038 and www.foxolutions.co.uk.